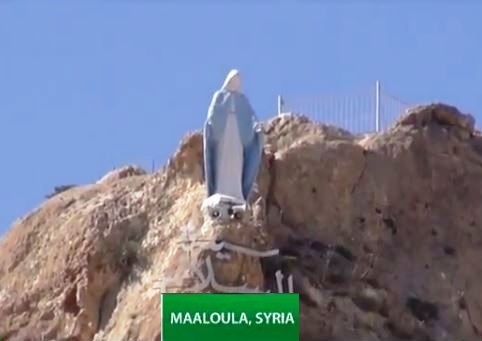 An official source has dismissed the reports of the ‘France Press Agency’ about terrorist mercenaries regaining control over the Christian historic town of Maaloula. Syrian sources confirming that this rumor is a fake and the takfiris are hidden on the hill, shooting on the village with mortars and snipers indiscriminately. The source added that Syrian Army followed a special plan; this plan makes militants think they made advancements and that they are in control. According to local authority, the Syrian Arab Army have surrounded the terrorists, killing scores of them, including the leader Mustafa Kahaleh and the leader of “al-Farouk Brigade”, who is called by “Abu Hadil” in Yabroud. Requiescat in hell. Syrian Arab Army has conducted a series of military operations against the headquarters of Al Qaeda in Lattakia countryside. 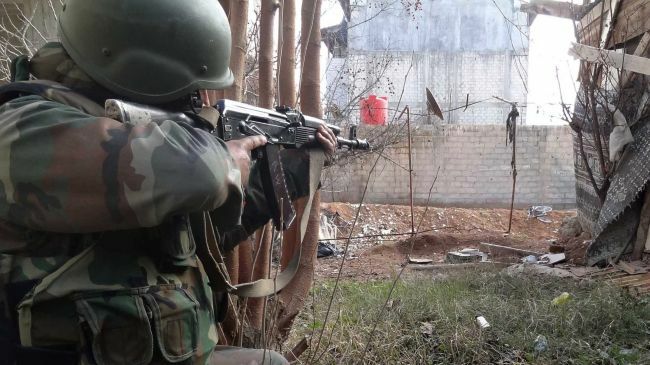 Army have set an ambush, and managed to kill 29 mercenaries of Arab and foreign nationalities of al-Nusra Front, in the village of Khan al-Jouz, in Lattakia countryside. In this ambush 6 cars equipped with heavy machineguns have been destroyed; the Libyan Abdul Salam and the Moroccan Ahmad Abu Sabra were identified among the dead bodies. Another operation was carried out by the Syrian Arab Army in Saqyet al-Kart village: 7 Dushka vehicles have been destroyed and two commanders of al-Nusra Front, Maher al-Shadad and Ayman Ahmad, have been eliminated. Requiescat all in hell. This entry was posted in +AAArchive, al-Qaeda, Christians, foreign-backed insurgency, foreign-backed terrorists, Jabhat al-Nusra, Maaloula, mercenaries in Syria, Syrian Arab Army, Takfiri militant, Terrorist attack, Terrorists, War Against Terrorism, War on Syria and tagged al-Qaeda, Antiochian Orthodox, Aramaic language, Free Syrian Army, Maaloula, Melkite Greek Catholic, Syria, Syrian people, Syrians Christians, Terrorist attack, Terrorists, Terrorists Gangs, United States, USA, USA crimes, War against Syria, War by Proxy, War crimes, War on Syria by syrianetwork. Bookmark the permalink. The Obama administration made massive miscalculations when it either directly or covertly supported false operation by using chemical weapons against Syrian civilians in order to create the request precondition for starting a war of aggression against Syria. It is clear that those behind this cynical plan made lot of glaring errors and Vladimir Putin came out and told the truth that the Syrian Arab Army did not use chemical weapons against its own people; that the Syrian Army is winning and that Assad has no logical reason to create the a situation in which foreign invasion of his country can be justified. Most critically, threats of military aggression and the show of massive military build up so close to Syria did not achieve theintended psychological effects the U.S. was hoping to achieve. Instead, the Syrian Arab Army stands firm. Critically important also is that Putin assured that Great Russia will stand firm and support Syria. With Great Russia showing all the support Syria needs, the Syrian people and the Army stand firm against foreign terrorists. We must also thank the American people who said to no to war of aggression against Syrian in such overwhelming numbers. Obama should be stripped of his Nobel Peace Prize and branded as a liar and a warmonger. The soldiers of the Syrian Arab Army are all heroes! I hope some of you read this and know that many of us here in the West stand with you and wish you all success in your fight for a Syria free from terrorists!